Please head to http://railsinstallfest.org to get started. 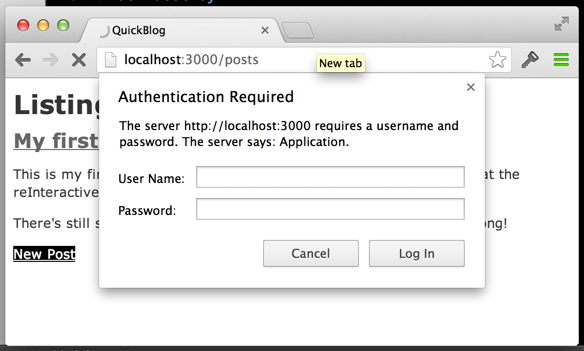 A working version of Rails 3.2 which you can install using Rails Installer for Windows or Mac. Sublime Text 2. If you prefer another text editor like vim, emacs or TextMate that's fine too but these instructions will specifically mention Sublime. Open two command prompts. One of these you'll use to run your local Rails server and the other you'll use for entering all other commands. Whenever you need to start or restart the rails server use one of these prompts, for all other command line work you can use the other. 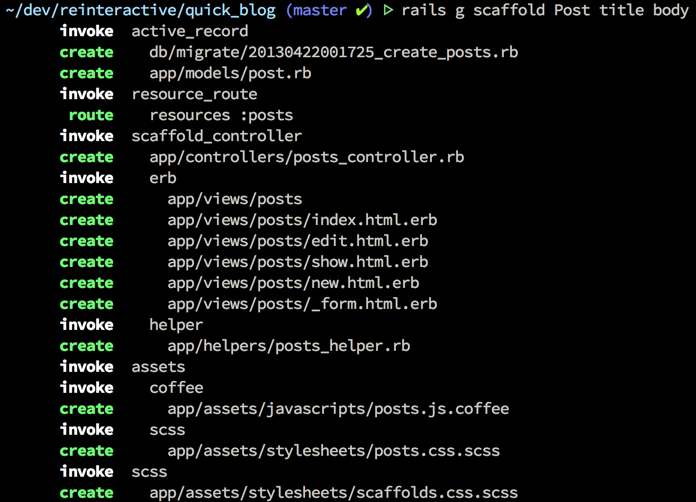 Now that you've created the Rails application you should open this folder using Sublime. 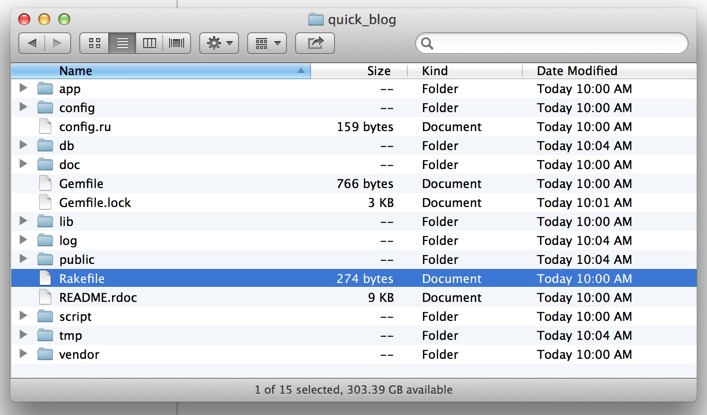 Open up Sublime, then open the quick_blog folder that was just generated. An important file that was generated was the migration file: db/migrate/20130422001725_create_posts.rb Note that you will have a different set of numbers for in yours. 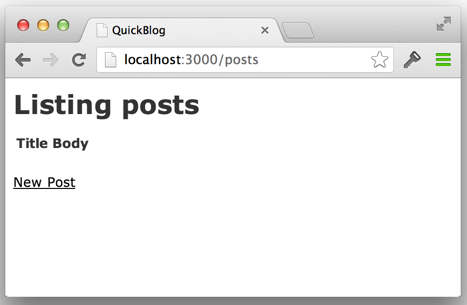 Once this command has run you can start up your Rails server again with rails server and then navigate to http://localhost:3000/posts to see the changes you've made to your application. From here you can play around with your application. Go ahead and create a new blog post. At this point you can refresh the show post page in your browser to see the changes you've made. Save all these files and refresh the show posts page. This is to check that you haven't broken anything with those changes. name == "admin" && password == "secret"
Overall your posts_controller.rb should have the following code at the top and the bottom of the file. Note that all the methods are exlcuded here for brevity. With that code in place you can try to add a new post and you'll be prompted to enter a username and password. Before we're finished with the backend for our commenting system we need to write the action that will create our comments. For more information on actions please read the Rails Guide on ActionController. Back in app/views/posts/show.html.erb you need to add in the form for submitting a comment so add the following code to the bottom of that file. Comments are now working (if they aren't make sure you restart your rails server) so go ahead and browse to your post and add a new comment. 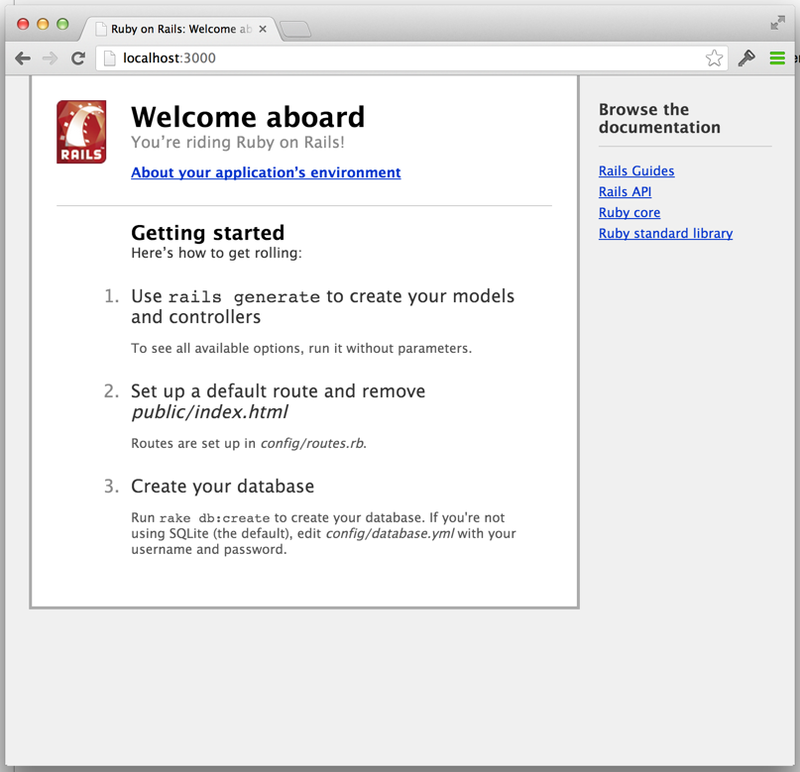 Heroku is a fantastically simple service that can be used to host Ruby on Rails applications. 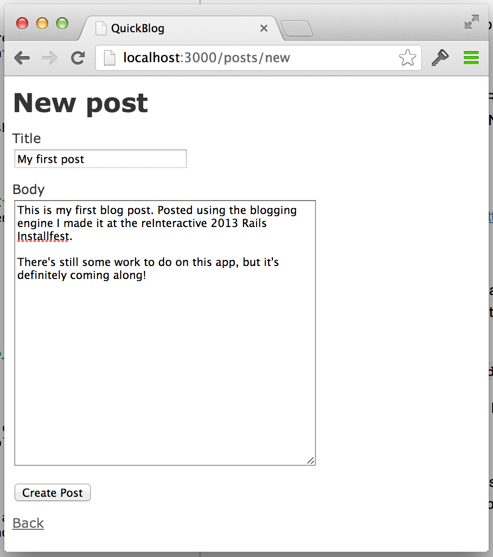 You'll be able to host your blog on Heroku on their free-tier but first you'll need a Heroku account. Head to https://www.heroku.com/, click Sign Up and create an account. The starter documentation for Heroku is available at: https://devcenter.heroku.com/articles/quickstart. You've already got an account so you'll need to download the Toolbelt from https://toolbelt.heroku.com/ and set it up on your computer. After this run the command bundle install --without=production on your command line. This setup should only need to take place the first time you deploy to heroku. Afterwards you may need to run db:migrate instead. Finally you should be able to browse to the URL that Heroku has given you and check to see that your blog has been deployed properly! Welcome to Ruby on Rails. If you're this far along you should definitely head on over to Part 2 which goes more in depth with Rails and begins to add more features to the blogging engine.